After many years in the offing – the Buxford Fish Pass was formally opened by the Mayor. It was hard to hear what Mayor Blanford said, due to the splashing of the water, but it was all good! The fish pass, which as it describes, will now allow fish to travel upstream of Buxford Mill to spawn. It has been funded by EA, designed by Mott MacDonald, built by I G Pilcher (in very difficult circumstances too! ), project managed by KSCP and supported by Ashford Borough Council. 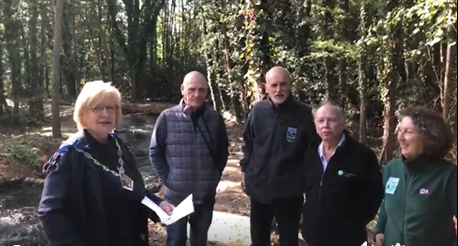 In the picture from left to right is the Mayor of Ashford – Jessamy Blanford, Terry Jones (Nature Conservation Officer ABC), Jon Shelton (Manager KSCP), Barrie Neaves (Catchment Coordinator – EA) and Diane Comley (Officer and project lead for KSCP).